I’ve been super busy lately and I took a short break from blogging after my audition. Anyway, I hope you’re all well and that your week’s manageable! We’re halfway through, we can do this. Do you ever feel stuck on what to work on? It’s like you feel guilty sometimes for not knowing what to do to be productive and progress in life. We all have those days! I’d like to share with you what I do to keep track of my progress. With each practice session, I reflect beforehand and plan out what I want to achieve, so here are some tips to write down a practice journal. Music students, this will be beneficial for you! Goals: At least 3 will do! Before each practice session/day, write down what you would like to achieve in your practice session. It will give you an idea of what to work on and give you a structure for practice. Write down the warm ups and pieces you’ll be practicing – each in a separate header. This will give you an outline on what you’ll be working on today. Write down what you enjoyed about your practice and your achievements. It will boost your confidence and self-esteem! Write down what you aren’t so satisfied with and still need to improve on. This will give you a good indicator of what to work on in your next practice session! I hope that you’ll find this useful! You’ll be surprised as to how productive you’ll be after taking time to set your daily goals – it also makes life a lot easier, who wouldn’t want that? Let me know how you get on. I hope your week goes well! How many of you plan ahead? Plan your week, day, what to wear or bring in advance? Or do you simply live in spontaneity and go with the flow? You could be either or even BOTH! Sometimes, I tend to get carried away with the amount of work I have to do and catch up on. When it gets overwhelming, I always procrastinate and distract myself. Chores and work isn’t going to magically do itself, you know. Guilty? I’m glad we’re on the same boat. It’s also nice to have a little spontaneity in life, but I personally find it better when I have everything planned as I do not have to worry about anything I haven’t done. I take Sundays as my planning days to make my life slightly easier. I plan my week ahead, review my schedule and do as much as I can to progress – that’s if I find the time. I have adjusted my work schedules so that I can have my weekends off to rest. Previously, I was working non-stop, weeks in a row – balancing teaching and working part-time in retail. It’s exhausting, I’ve burned out so many times to keep myself busy to the point where my body couldn’t handle it. Planning and preparation is essential, I need to get organised for me to think clearly and be stress-free as much as possible! It keeps me on track, as I tend to be forgetful (I am getting old!) which caused me to miss important appointments. You never know who you might encounter or what opportunities may arise, you always have to be on your A-Game. First impressions last forever and you certainly do not want to be known for your unreliability, you could lose potential clients or connections. I have a 2019 Diary, Weekly Overview and a Calendar and I keep them on my desk and in my phone, open to the current week and month. I keep it visible so that I am aware of what’s on and plan what to do. Last thing I want is to be late and unprepared for anything – not a good impression. I have an app which tracks my screen time and habits on my phone. The amount of time I spent on my phone is absolutely shocking – it tracks how many hours I spent on social media and how many times I have opened the apps. Ever since, I have cut down my time on my phone and my productivity has increased. I am big on saving money, I keep a separate notebook as my budget tracker knowing my saving and spending habits. Keeping a budget for every category such as Food, Transport etc. (I could make another post about Budgeting, it is effective and I enjoy it a lot!) I also put a percentage of my income into my savings that is left untouched and I’m surprised by how much I have saved in a short amount of time. I have 2 journals – one for reflections and the other for Piano & Teaching practice (Music). I like to keep a personal diary to jot down my thoughts and feelings as it calms me. I use my Music journal to take down notes and establish my goals during each Practice session, the same goes for my Teaching and Audition preparation. Seeing how far I have come is very fulfilling especially when you’re feeling stuck. After starting some serious planning, I have seen huge improvements and achieved more than I expected. If you’re feeling like your schedule is hitting you like a truck, I suggest you start planning and preparing. It makes your life a whole lot easier. Here’s to a stress-free lesser stressful life! 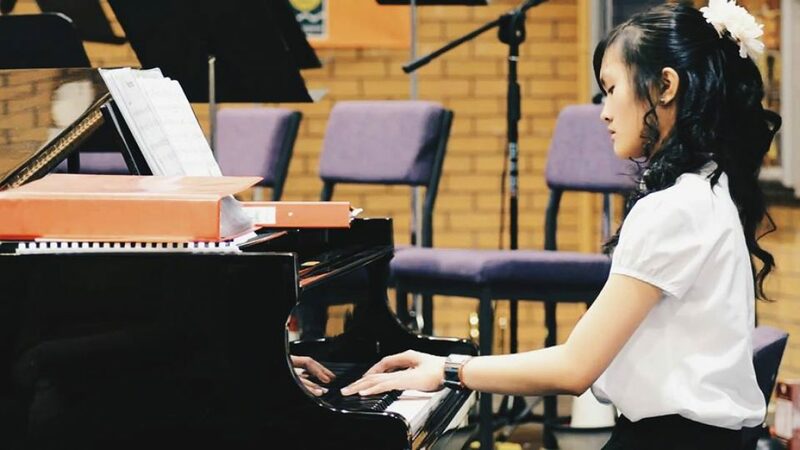 I have had a hectic start to 2019, preparing for my Piano recital and Bachelor of Education (Music) audition at the Royal Conservatoire of Scotland. It has been a rollercoaster of emotions, panicking here and there internally during practices and then having an unusual wave of calmness on the day itself. Last year, in November, I sat an ABRSM (Associated Board of the Royal Schools of Music) Performance Assessment for the first and third movements of Beethoven’s Sonata ‘Pathetique’ in C Minor, op. 13. I challenged myself to play from memory under pressure and pushed through! The examiner definitely enjoyed my performance and gave me lots of feedback on it, areas to develop and improve on. I took her advice and started working on the whole Sonata, November to January may seem like a lot of time but it wasn’t. I barely had time to have consistent practice as it was peak season in retail so I had to work a lot with long hours, many days in a row, leaving me too exhausted to practice. Once January came, I had more time to focus on it in practice and during lessons – playing from memory under pressure is a huge obstacle for me and fear overwhelms me always. I did all the work, I knew the piece inside out, knew all the notes as I have been working on this Sonata for over 2 years now. I hesitated performing the whole Sonata as it was daunting – it was 18 minutes long and it really tested my performance endurance. When the day came, I was still in panic mode in the morning at the Piano Day in Glasgow City Halls. My mentor and Piano teacher who organised the event spoke to me to help me calm my nerves, reassuring me that everything is going to be alright. I taught some upper secondary school students in groups and individually on Piano, giving them a masterclass style lesson on how to improve their playing and performance. It was inspiring to see them progress and enjoy performing on Piano in front of an audience, as if no one was watching. It reminded me of when I first started playing and how much I loved and enjoyed it. I took that inspiration from the students and focussed during my pre-recital practice. Reminding myself that I love performing, bringing me back to that feeling of enjoyment instead of performing for the sake of getting it done and over with. Within that hour, I managed to change my mindset and performed the whole Sonata from memory. I was the finale performer, so the pressure was on but I find speaking about the composer and the piece to the students calming and eased me. It was a huge achievement for me to have played the whole Sonata from memory, all of the years of hard work was worth it! It was so fulfilling to receive the reception from others and I am glad to have inspired the young Pianists. I hope to perform again soon! Soon after the Piano Recital, I got my head back in gear for the audition. This is my third time auditioning, after unsuccessful ones. I was at the Royal Conservatoire for 4 hours and spent Valentine’s Day auditioning – who needs a Valentine anyway? The audition pieces I chose for Piano were the Brahms Intermezzo in A Major, Op. 118 No. 2 and Bartok’s Bulgarian Dance No. 3 from ‘Mikrokosmos’ Vol. 6. It shows an interesting contrast between pieces, Brahms was a Romantic style piece and Bartok was a folk song in the 20th Century period. The singing audition piece I chose was Handel’s Aria Lascia Ch’iopianga from the Baroque period. I had an interesting programme and showed different styles from different musical periods. In the audition, I had to present a singing piece, two audition pieces, a set piece, keyboard harmonisation and sight reading – all in a 20 minute audition. In preparation for this, I attended regular Vocal and Piano lessons at the Royal Conservatoire as part of the Transitions programme and also some audition preparation courses. It was an advantage for me as I knew the audition panelists as they have taught me before. I was surprisingly calm the day before and when I entered the audition room. I warmed up in one of the practice rooms with a Steinway Grand Piano and I enjoyed it, I took it as an opportunity to showcase what I have to offer – the nerves went away as I started to play. There were 3 panelists in the audition: a specialist of your principal study, head of department and a principal/school teacher. I loved how calm they made me and I found time to settle down before starting. It wasn’t as daunting as before. It was ecstatic to get my hands on a Steinway Grand Piano again, as this is a rare opportunity. I then took a Grade 5 Theory Paper which lasted for an hour. I found it manageable, although I did forget one music concept and it was a basic one. How could I have mistakened Largo for fast? For those of you who do not know, it is a Tempo marking (speed of the piece) that means slow and stately. That was probably my only regret of that day. Other than that, I was satisfied with the exam. Lastly, I had my interview with the department of Education. The head of the panel remembered me from last year. I spoke about my performance and teaching experience in the classroom. Music has always been something so dear to me as it helped me discover who I really am and it gave me a way to express myself. With the guidance of my Music teachers, I was inspired and want to pass on the experience and knowledge that I got to the next generation of Musicians. It introduced me to a community that made me feel welcome, I found my sense of belonging playing and performing with others in ensembles and bands. It helped with my discipline and kept my passion burning. Believe in yourself, challenge yourself to grow and keep striving for your dreams! I hope everyone had a great week! I had a lot of challenges to face this week, I even fell in a slump with the amount of workload I had to do. I started my work experience in my previous high school in the Music department where I observed classes and instrumental lessons. I was blessed to have such a great opportunity and to finally see the classroom from the teacher’s perspective. It was great to see my previous Music teachers again and to finally work alongside them, it feels like I have come a long way – and yes, I do feel old! It’s a joy to see how they teach and it made me dream of getting my own classroom. I helped the students out and I am glad I made a great impact on them, seeing them improve and give an effort because of my encouragement and motivation is very fulfilling. I’ve also had some funny moments, especially with the first years, they’re really excited and keen to learn. One of my previous teachers had me play in front of her first year class to inspire them and a young boy came up to me asking if I knew Anime. I tried so hard to contain myself from laughing. I am also surprised by the different maturity levels in different year groups, it is a challenge to maintain the whole class with different learning abilities. I applaud all teachers for that, it is not an easy job. My week in general, has been stressful – felt like a rush all the time, like I’m falling behind. Balancing with work experience, RCS, teaching and work; it took a toll on me physically and mentally that I had to give myself time to rest. I tend to be forgetful and scattered in my thinking at situations like these, I made mistakes but I have to accept, learn from it and move on. Making time for rest is essential, it’s for your own good too. To recalibrate and reflect on yourself, it keeps you on track and it brings you back to the present moment. I spent some time this weekend with my family at home, went to see the Royal Scottish National Orchestra yesterday and Alita: the Battle Angel earlier on. Moments like these are the ones that matter the most, to relax and spend time with your loved ones. Every week, I head to the Conservatoire for my lessons and practice. I’m quite fortunate to get music lessons from one of the best music conservatories in the world and get to use the facilities, making my experience worthwhile when I still have the time before heading off to do Music at university level. A typical day for practice, on an ideal day is 4 hours, split morning and evening. I spend my evenings in the practice rooms in RCS on their grand pianos, to get used to the feel and touch of it – every piano has a different feel. I usually have a routine, starting off with Hanons, scales and arpeggios as warm ups and usually spend 15-20 mins on it, then I take a tiny break to plan what to practice and what I want to get out of the session. I take my pieces apart, section by section, hands separately then together, focussing on the quality of sound rather than getting through it mindlessly. Guilty for practising mindlessly, I get nothing good out of it and it does more harm than good. When I start to get restless, I take a 10-15 min break then resume practice again. I like to change up my practice routine from time to time so it doesn’t get boring. I record the pieces I feel that are performance ready. After my practice session, I write a reflection in my practice journal and see where else I can improve on. It works whenever I have a goal to reach. Consistency is key!